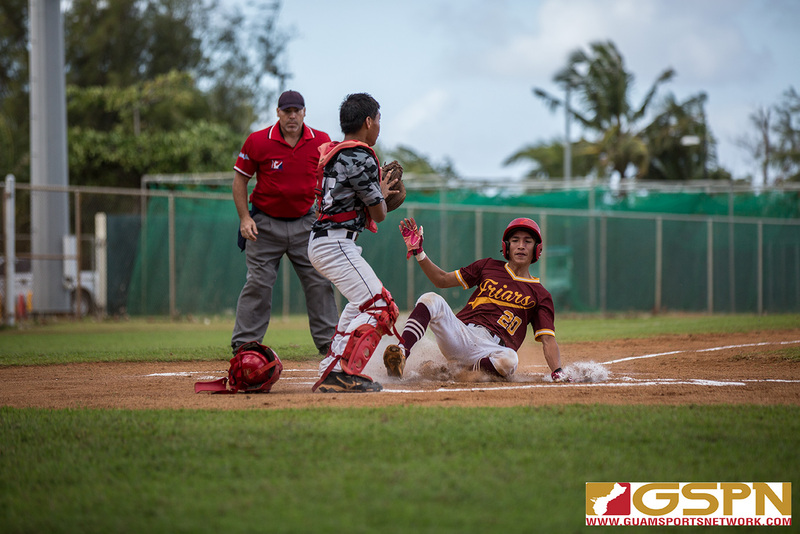 The Friars and Sharks faced off at Paseo Stadium Wednesday afternoon in the semifinals of the IIAAG baseball playoffs. The game ended up being called after five innings thanks to the mercy rule, with the score totalling 14-4. The GW Geckos won their matchup against the Tiyan Titans 19-11, setting up a Friar vs. Gecko clash for the league title. Both teams looked sharp as nails in the first inning, as no hits or runs were allowed, thanks to the defenses on both sides. The Friars got past the Shark defense in the bottom of the second inning, when they struck gold by earning six total runs in a short amount of time. This was not the only time a scoring surge occurred for FD, they had a four run streak in the bottom of the fourth. Sanchez scored four of their own runs, three of which were scored in the top of the fourth when slugger Sigi Sanchez hit an RBI double. The first inning was full of suspense, due to pitchers on each team leading their respective sides to sharp defensive efforts, causing quick one-two-three stretches. The bottom of the second inning is when the action began. Six FD runs were scored in this part of the game. These runs came off of a set of five RBIs. The first RBI came from Ethan Lobaton, who hit an RBI single, sending Kai Akimoto home. The next was an RBI double hit by Jake Carbullido. The last RBI which sent three runners to home plate was hit by Nicolas Charfauros. The score at the end of this inning was 6-0, Friars looking very dominant. In the top of the third, Sanchez scored a single run. This was scored by Daniel Blas, after he hit an RBI double, sending Tyler Santos home. Two more FD runs were scored in the bottom of the third inning. Both were scored by Jake Carbullido. One of his runs was done by hitting an RBI, the other was scored when he stole home plate after a bad pitch. The score at the end of the third inning was 8-1. The top of the fourth brought forth a triple set of Shark runs. These were scored when Sigi Sanchez hit an RBI double, allowing three baserunners to score. The score after this burst of energy was 8-4, Sanchez inching back. Despite being scored on big time, FD scored five runs to regain the margin of victory in the bottom of the fourth. These runs were scored after Nicolas Charfauros stole home, setting off a chain reaction full of RBIs. The score after this was 13-4, FD just one run away from setting off the mercy rule. FD completed the hold on Sanchez to secure their close score. The walk off run was scored in the fifth inning by Jake Carbullido, who hit a walk off RBI to shallow left field. This ended the game. The Friars are headed to the Championship game on Saturday at Paseo Stadium and will play the winner of the Tiyan/GW game.